This pie is just what you need in that odd time between Christmas and New Year. It is comfortable food, filling, cheesy, makes the kitchen smells divine, and takes a while to put together. So, it’s ideal to make when time stretches ahead of you and it’s cold outside. You can make the cheesiness stronger or subtler by varying the type of cheese you use. Place the cabbage pieces, in four batches, into a large saucepan of salted boiling water, and cook for two minutes. Drain, refresh in iced water and set aside on kitchen towel to drain well. Add the potatoes to the pan, cook for two minutes. Drain, refresh in iced water and set aside on kitchen towel to drain well. Use six of the largest cabbage leaves to line the base and sides of a lightly greased 22cm round cake tin. Leave approx. 8cm of leaves hanging over the side of the tin. 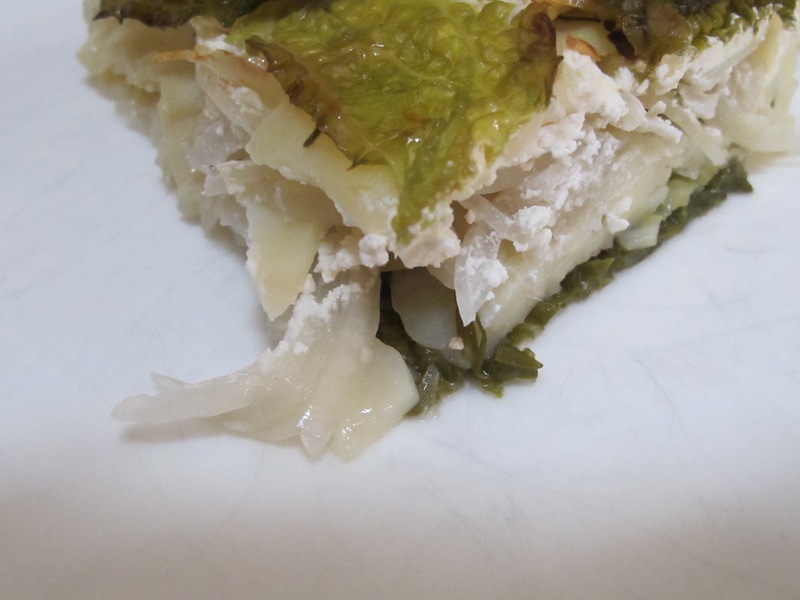 Depending on the size of the cabbage leaves, you may need to cook more – I did. Into the tin, place a layer of potatoes, slightly overlapping the slices. Next add a layer of onion, tarragon and cheese. Repeat this twice to create three more layers, until your ingredients run out. Fold over the overhanging cabbage leaves and press well to enclose. Place the tin into a large deep-sided roasting tray, and pour in enough boiling water to come halfway up the sides of the tin. Cover the whole thing with kitchen foil. Cook for 60-70 minutes, or until the pie is tender when tested with a skewer. Remove the foil, brush the top of the pie with the olive oil, and cook for a further 15-20 minutes or until the top is golden and crispy. Remove the tin from the water bath, cut into wedges and serve. This recipe is by Donna Hay, check her website for more recipes. This entry was posted in A love of food and tagged Andalucia, food, recipes, Sandra Danby, Spain on December 27, 2017 by sandradan1.